Have you ever noticed the abundance of golden-hued flowers offered up at springtime? It's as if Mother Nature recognized our need for glimpses of garden sunshine as winter recedes, and so worked overtime to provide us with delightful choices. Blooms that herald warmer days ahead include forsythia, daffodils, winter jasmine (Jasminum nudiflorum), wintersweet (Chimonanthus praecox var. luteus) and witch hazels (Hamamelis x intermedia 'Arnold Promise' and 'Primavera'). 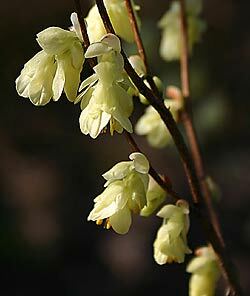 I have a soft spot for daffs but my favorite ray-of-sunshine shrubs are the winter hazels (Coylopsis sp.). The chains of delicately scented, yellow bells of buttercup winter hazel (Corylopsis pauciflora) completely captivated me the first time I saw it in bloom at the Jane Kerr Platt garden in Portland. At the time, these were not easy shrubs to find but dogged persistence paid off. Eight years later, my small 2-gallon shrub has grown to 4.5' tall and 6' wide. Eventually, it will mature to an 8' x 10' shrub. When blossoms appear on the Bethlehem sage (Pulmonaria saccharata 'Mrs. Moon') planted underneath my buttercup winter hazel (Corylopsis pauciflora), I know that it won't be long before its airy limbs drip with delightful, lemon yellow blossoms. As the flowers begin to fade, the leaves unfurl from their pleated, Japanese paper fan folds into slightly creased, toothed, bright green leaves with pink edges. The pink edging on the hazelnut-like leaves fades as the leaves age, but the overall appearance is still lovely. In fall, the shrub colors to a clear yellow, a lovely beacon in a lightly shaded corner of my garden. I enjoy the foliage show almost as much as the floral display. Even in winter, its graceful, arching branches continue to please me. 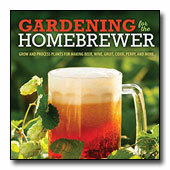 Yes, I would not be without this shrub in my garden. (Galanthus elwesii), Chionodoxa, cyclamens, and winter-blooming heaths and heathers, such as Erica x darleyensis 'Kramer's Rote'. Provide an evergreen backdrop to add more pop to the combinations. C. glabrescens appears to tolerate full sun better than other species but, in general, winter hazels prefer lightly shaded, wind-sheltered situations. Afternoon shade, particularly in the valley, provides the most protection against leaf scorch during stretches of blistering summer weather. Once established, they may tolerate brief periods of drought, but they generally perform best with summer irrigation. 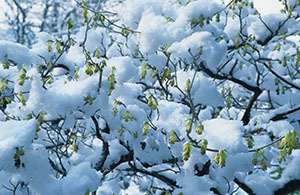 The open structured winter hazels require little pruning. When necessary, prune a branch completely to the ground rather than heading it back, to retain its natural grace. 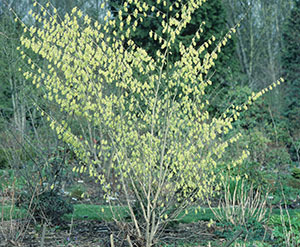 Buttercup winter hazel (C. pauciflora) can be trained to grow against a north- or east-facing wall. I feed mine with a top dressing of compost twice a year. I've never found it necessary to provide additional fertilizers. I warn you that falling in love with winter hazels may only be satisfied by a trip or a call to a specialty nursery. When you do find a shrub, it will likely be a small specimen, and it will probably cost more than a more common shrub. However, if you weigh the cost of chasing sunshine via a corylopsis versus a trip to southern climes, it comes out as a great bargain. Well, what are you waiting for? Get out there and purchase your own little bit of spring radiance. You won't regret it. Top photo: Corylopsis pauciflora © by Debbie Teashon. Corylopsis spicata image © Richard W. Hartlage/Courtesy of Great Plant Picks. Corylopsis glabrescens image © David Jones/Courtesy of Great Plant Picks.